A paper published online today in the Journal of Geophysical Research, Atmospheres lends credence to the cosmoclimatology theory of Svensmark et al, finding that increases in galactic cosmic ray counts (GCRs) have a statistically significant correlation to increased cloud formation. The most obvious way for warming to be caused naturally is for small, natural fluctuations in the circulation patterns of the atmosphere and ocean to result in a 1% or 2% decrease in global cloud cover. 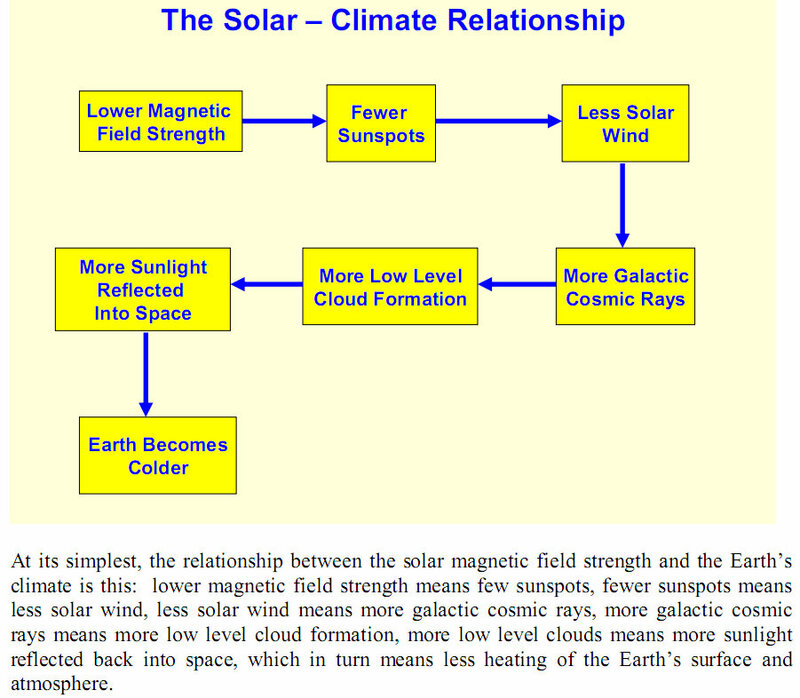 Clouds are the Earth’s sunshade, and if cloud cover changes for any reason, you have global warming — or global cooling. Given the potential magnitude of these effects, there is no reason to infer that changes in trace "greenhouse" gases such as CO2 have had any effect on the climate. Abstract: The cloud index (CI), the cloud occurrence frequency (Occ), and the extinction data (Ext) of the Michelson Interferometer for Passive Atmospheric Sounding instrument on board Envisat (MIPAS-E) from July 2002 to March 2004 are used to investigate a possible link between galactic cosmic rays (GCRs) and midaltitude and high-altitude clouds (CI, Occ: 9–18 km, Ext: 12–24 km). The zonally averaged data with 3 km vertical resolution are averaged over six major Forbush decrease (FD) events and subsequently correlated with the Climax neutron monitor data (CNM). In order to allow for nucleation and growth of ice particles, time lags from 0 to 5 days are applied. We find several weak but statistically significant correlations with an excess of positive cloud-GCR correlations. Introducing a time lag does not enhance the correlations significantly. Subdividing the data in a global grid with 30° × 90° × 3 km resolution shows higher correlations in some regions. The investigation of the individual FD events yields a heterogeneous picture. Overall, there is a weak tendency toward a positive cloud-CNM correlation. A Kolmogorov-Smirnov test shows that for time shifts from 0 to +5 days a weak GCR-cloud effect is evident in the MIPAS-E measurements. An estimation of the impact of this effect delivers that a 15% increase in CNM would result in a small decrease in CI (corresponding to an increase in cloud opacity) which is most pronounced at 9 km altitude (−9% to +0.5%). For log(Ext) a decrease of −5 to 0% is calculated at 12 km altitude which shifts toward weak positive values at higher altitudes. Hot diggety dawg! Climate SCIENCE for a change. You might consider the height of the clouds, the sign of the correlation and what follows for the energy balance of the planet. Actually if these results are confirmed a weaker sun heats the planet. 2. The abstract says "a 15% increase in CNM would result in ... an increase in cloud opacity," so unless the abstract is worded incorrectly, there is no problem with the sign of the correlation. This would also be consistent with earlier statement of a "positive cloud-CNM correlation." 3. The claim that high altitude clouds warm the planet because they "absorb more IR and reflect less sunlight" seems tenuous at best. Incoming solar energy is 45% IR, so these clouds absorb significant amounts of solar energy BEFORE it reaches the earth, thus acting as a sunshade. Furthermore, high altitude clouds at -18C or less are not capable of heating the earth at 15C because "a cold body cannot heat a warm body" from the 2nd law of thermodynamics. 1) Exactly. And this study looked in lower cloud layers. 2) Correct. More opacity means mor cirrus means more warming. 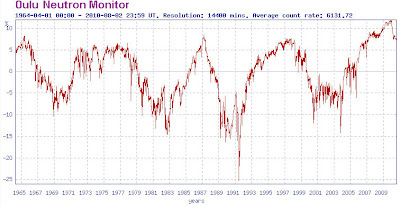 Correlation thus is: More cosmic rays, more warming. even larger than what is presented." "Furthermore, high altitude clouds at -18C or less are not capable of heating the earth at 15C because "a cold body cannot heat a warm body" from the 2nd law of thermodynamics. " Sorry. I took you serious for a moment. Havent seen this sentence. 3. 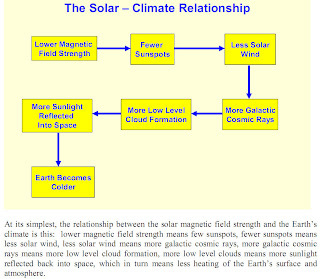 The 'radiative behavior' of different cloud types is irrelevant because all types of clouds radiate at a temperature lower than the Earth. Per the Clausius formulation of the second law of thermodynamics, a colder body cannot heat a warmer body. You don't have to take me "serious," just Google 'Clausius formulation 2nd law' for thousands of references. Then read the G&T paper, Thieme paper, Chilingar paper, etc. and many other references on this blog e.g. 2) Well the Choi Paper says not and he shows it with observations. 3) I read them already. 2. Lindzen & Choi measure RADIATION - no doubt clouds and 'greenhouse gases' radiate. Unfortunately, like most climate scientists they assume that means that any colder body which radiates can heat a warmer body, but this is clearly false unless you overturn the basic laws of 19th century thermodynamics.